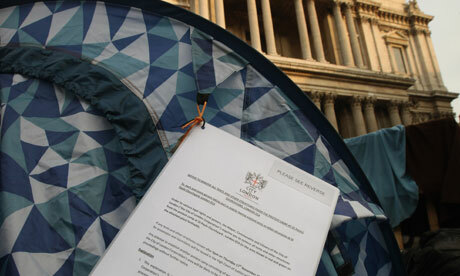 The City of London Corporation has attached eviction notices to tents outside St Paul’s Cathedral, telling activists to move them from the public highways by 6pm on Thursday or face legal action. It is the latest development in a month-long saga that has pitted the protest movement Occupy London against the corporation, the local authority for the Square Mile, and St Paul’s. Both institutions own the land around the church but only the corporation is pressing ahead with court proceedings. The notice is addressed to “each and every person taking part in and/or having erected tents or other structures at St Paul’s Churchyard EC4”. It reads: “Through the erection of tents and other structures, you and others involved in the Protest Camp have taken possession and control of the Red Land from the City of London Corporation without its consent. Stuart Fraser, policy chairman for the corporation, told Channel 4 News on Monday he was prepared to use “all legal measures” including riot police to remove them. This is another Occupy camp added to a long list of camps and cities which have been, and are being, evicted. It is almost as though those with the “power” have been entertaining themselves when the camps first starting growing across the world and simply tolerating their existence. Then when the realization finally starting sinking in that the Occupiers, in addition to those who support the movement from their own homes, meant business, fear began to sink in. Now the corrupt companies and government are concerned because an awakening is occurring and spreading at the speed of the internet. Their greedy lifestyles are being exposed and their future is compromised. “Profit before people” is now exposed and what has been seen as conspiracy theories are now being proven as fact. I would start quaking in my shoes, too. The people mean business. They will not stop nor tolerate this abuse any longer. 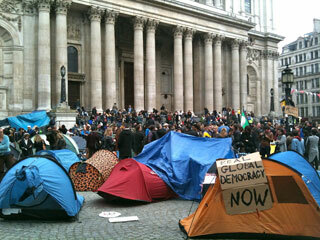 Occupy responded to the threat of eviction by saying it was “not the least bit concerned about the road ahead”. 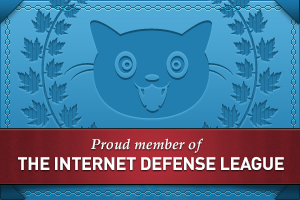 Whatever it takes… What do so many have to lose? Many do not have a job to lose. 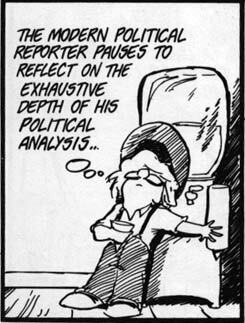 Others are overworked and underpaid with little to no benefits. A better future for themselves and their family is more important than a job which goes by the “profit before people” philosophy. The risks are minimal when compared to the outcome. Is this eviction about money? Of course it is…. 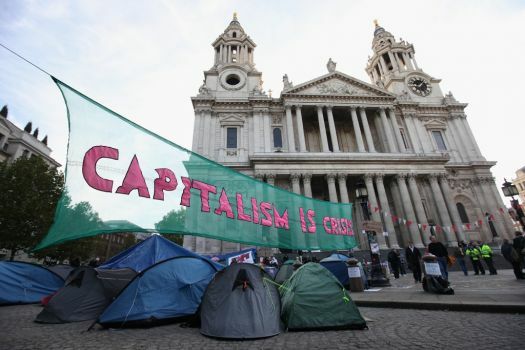 The cathedral lost £120,000 in revenue during its six-day shutdown last month because of the protest camp, according to the contract caterer Habour & Jones, which runs the restaurant at St Paul’s. Churches have grown to be considered by many as one of the most corrupt entities in the world. Greed, scandal, and using/abusing the system are their priorities in life. Now the camp here has cost them money. Do they care about the welfare of the individuals camped outside? Absolutely not. Rather unchristian-like if you ask me. Battles may be lost, but that which does not kill us only makes us stronger. The war will continue on. Bill O’Reilly: The Occupy Movement is “a failure.” I am so LMAO at you, Bill…. I don’t understand this…. I just don’t understand. What is going on in our world? In our country? I never thought I would ever see this here. Never.